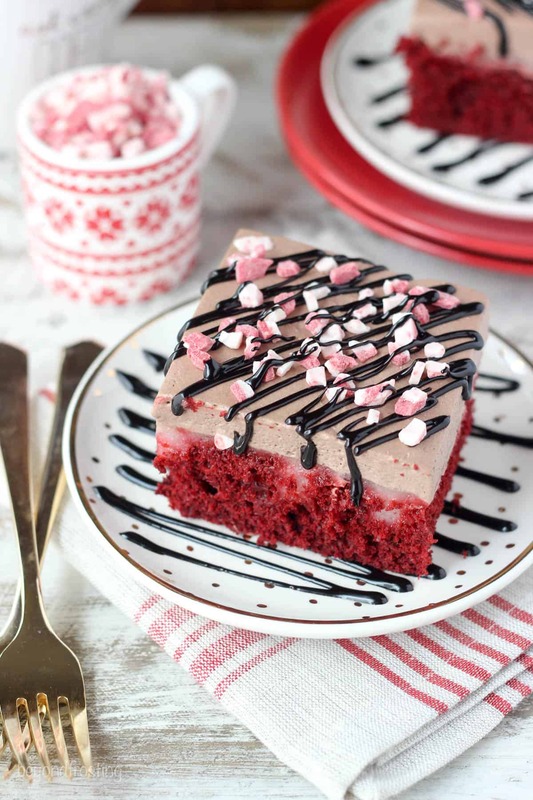 This festive Peppermint Hot Chocolate Poke Cake is everything you need for your holiday dessert. 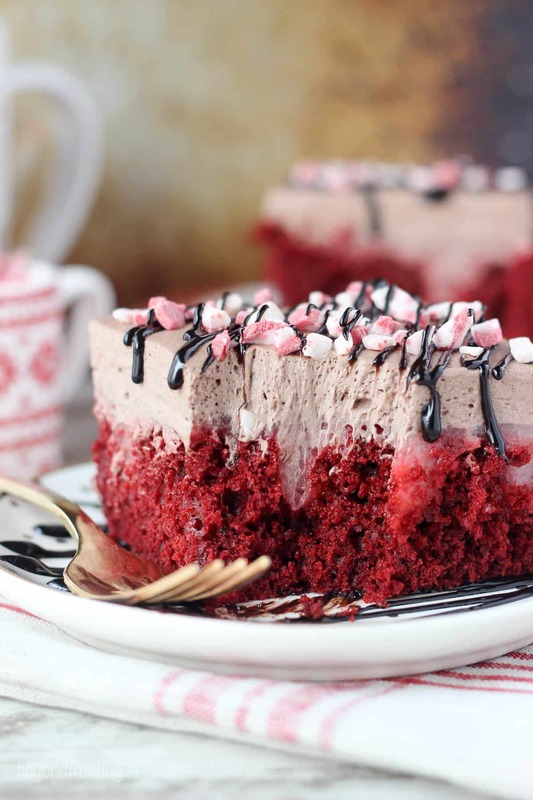 A peppermint red velvet cake soaked in a white chocolate pudding and topped with hot chocolate whipped cream. Do you see a pattern here? Eggnog, peppermint, eggnog, peppermint. I didn’t even realize until I published this post that you were getting yet another holiday recipe. Please forgive me because later this week you’re getting gingerbread. Sometimes during this time of year I get all these crazy ideas and I have so little time to do them. After all, it would not be acceptable if I posted a peppermint recipes in January, right? In January, you all disappear from my life for a month while you try to get back on track after your holiday binging. But fear not, I am here to welcome you back with open arms come Valentine’s day when you’re in need of some chocolate. 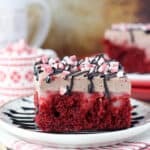 Before we get ahead of ourselves, we need to slow down and talk about this Peppermint Hot Chocolate Poke Cake. As you can see from the photos, it’s obviously red velvet to! 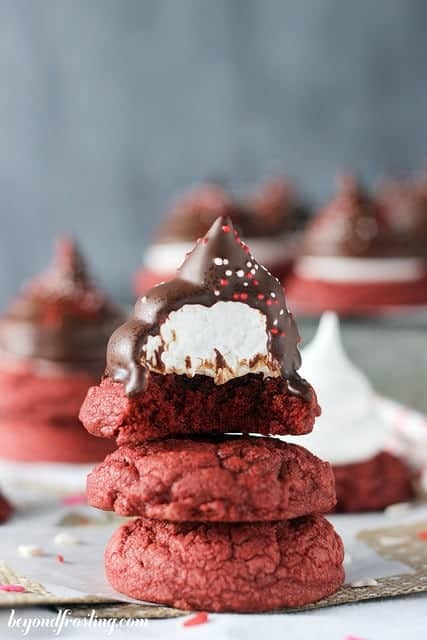 I am going to let you in on another secret, my boyfriend thinks I try to stuff to many things into one recipe, and sometimes that’s absolutely the case (I am looking at your Bourbon Bacon S’mores Cookies). So we debated over how to name this recipe. 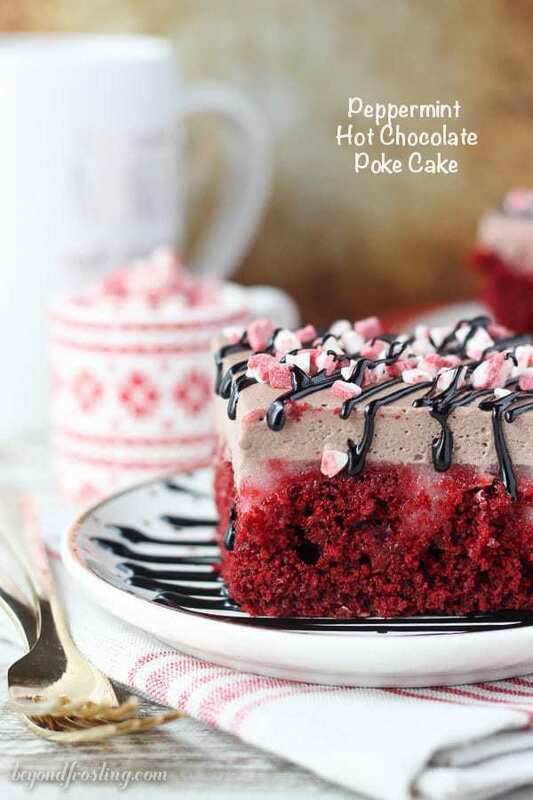 Should it be Peppermint Red Velvet Hot Chocolate Poke Cake? 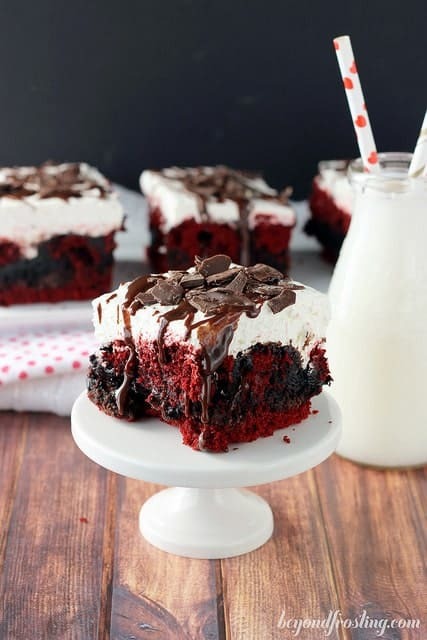 Or maybe Red Velvet Peppermint. “It’s too many things” he says. Whatever. This cake is a red velvet cake with a touch of peppermint flavor, then it’s filled with a white chocolate peppermint pudding. For the topping, I used my favorite hot chocolate whipped cream. It’s more like a mousse than a whipped cream, it’s thick and creamy and not too sweet. To dress up this cake, drizzle on some hot fudge sauce and sprinkle it with some Andes Peppermint Crunch. I always recommend that you be careful not to have a heavy hand with the peppermint. A little bit goes a long way here. So add to taste by starting with half of the amount called out in the recipe, and then decided if that’s enough for you or if you need a little more. 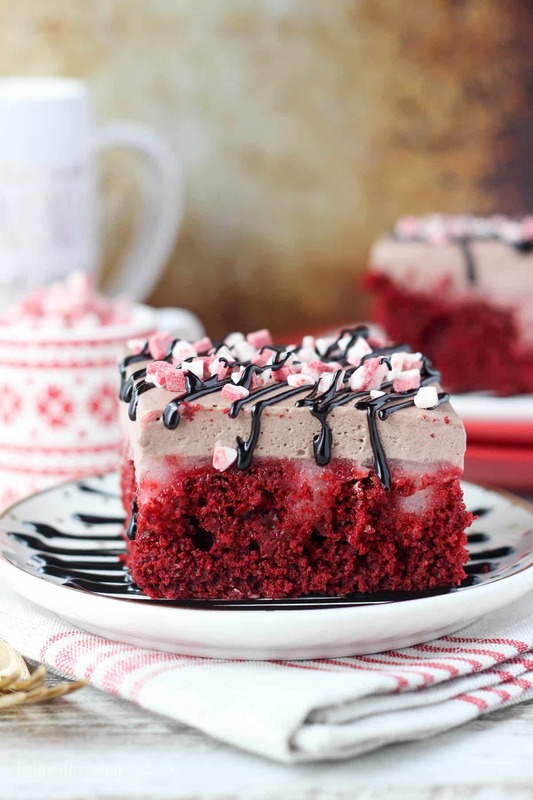 Let’s get festive with this Peppermint Hot Chocolate Poke Cake! 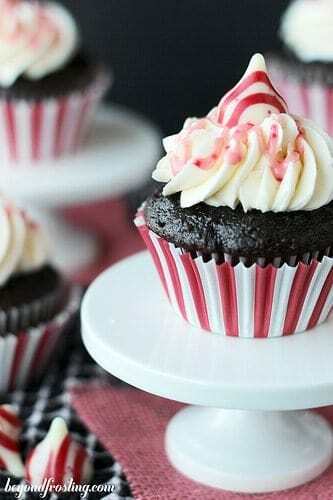 It’s not to be confused with my Peppermint Hot Chocolate Cupcakes. This festive Peppermint Hot Chocolate Poke Cake is everything you need for your holiday dessert. A peppermint red velvet cake soaked in a white chocolate pudding and topped with hot chocolate whipped cream! Prepare the cake according to the instructions on the box, combining the cake mix with eggs, vegetable oil, water and peppermint extract. Beat on medium speed until well combined. Bake the cake in 9×13” for 18-22 minutes. Check for doneness by inserting a toothpick into the middle of the cake. If the toothpick comes out clean, your cake is done. Allow to cool for 10 minutes. For the filling: When the cake has cooled, prepare the pudding layer by mixing a package of instant white chocolate pudding with 1 ¾ cups of cold milk and add the peppermint extract to taste (1/8 tsp to ¼ tsp). Before the pudding sets, pour it over the top of the cake and put the cake in the fridge to let the pudding set, about 15 minutes. For the whipped cream: Put the bowl and whisk attachment in the freezer for 5-10 minutes to get them really cold (this step is optional, but a common practice I use.). In the cold mixing bowl, beat the heavy whipping cream on medium speed for about 2 minutes. Add the hot chocolate mix and increase the speed to medium high. Beat until stiff peak form. Spread whipped cream over the top of cake. You can top you cake with a chocolate drizzle and some crushed Andres Peppermint Crunch. This cake must stay refrigerated. Hello Christmas dessert! This will be perfect for an after roast beast dinner! My son loves red velvet n chocolate mousse, well that’s Icing on the cske!! Lol THANKS SO MUCH, MERRY CHRISTMAS! ! This cake is perfect for the holidays! I love that whipped cream! I love how colorful this dessert is! Everything about it looks incredible! any of your cakes soaked in anything is worth every calories. Just the peace and stress relieving qualities are worth noting. yum.